'Saved posts' is a useful tool that Facebook has had for some time now. It seems that the social media giant has been carefully looking into how people use the feature. One of the ways in which people use it is that they tend to save posts that they want to show to other friends. This is in a lot of ways what Pinterest does really well. It allows you to share the cool things you see in a much more practical way with a list of people. "We started rolling out the collection feature over a year ago as a way to help you save, easily organize and find posts from a friend or Page you follow, an ad, a Watch video, or Marketplace listing. Millions now use the feature each day, grouping this content into collections like “Living Room Remodel”, “Outfit Inspiration” and “Fitness Favorites.” And we’ve heard from people that they want to be able to share these collections with their Facebook friends. ", announced Facebook team in a blog post. Explaining further, "With today’s launch, you can now share a collection so friends can view the content you’ve gathered and add new posts." It seems like Facebook will be taking a leaf out of Pinterest’s book by letting you share your list with your friends. This is going to be great for the Holiday season. This is because of the fact that so many of the gifts that we think of buying our friends and family can now be found on Facebook. Hence, it is only natural that people would want to keep these lists in check. You can save a list of things that you might want other people to buy you as well. This is going to make it a great deal easier for them to figure out what to buy you. 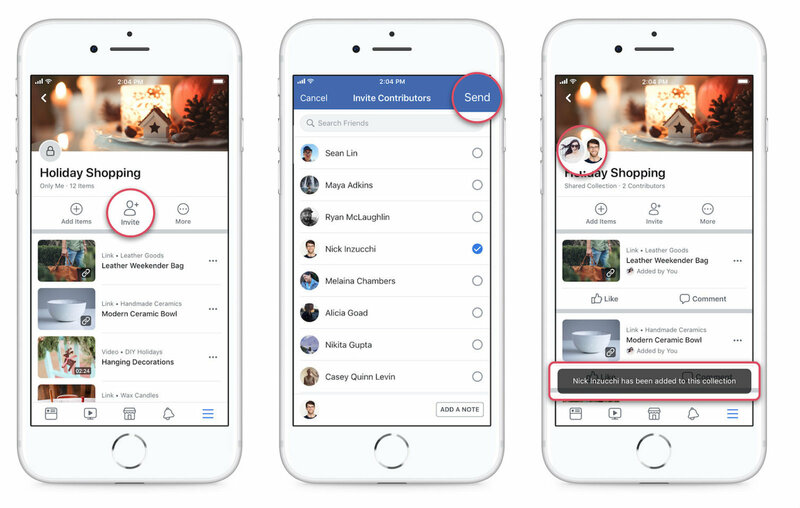 This new feature shows that Facebook is getting savvy about what its competitors are doing, and is taking steps to give users those features from within a single platform. Pinterest is a fairly influential social media platform, and Facebook offering this feature shows that they are taking their competition seriously. This could potentially mean that a lot of people that use Pinterest would end up doing the same things on Facebook instead, but seems unlikely that this would be the case at least in the short term because Pinterest has a dedicated following.